I was an eating machine, a food-addict, the "big guy" at work; I lived to eat. I knew I needed to make a change and I could not do it alone. This is when I found BeliteWeight. My patient facilitator and I discussed and decided that the gastric sleeve procedure was the perfect fit for me. Going into this surgery in Mexico, I never knew the outcome would ever lead me to meeting such a great group of people, now whom I call friends. When you arrive, you are picked up by Alberto, who was an absolute blast. He loved his country and showed me how wonderful it truly is. The doctors are there for you through it all, when I needed something, the nurses and doctors would be at my hospital bed in less than 30 seconds. It's just the personalization that makes everything perfect. In one month I went from a size 60 to a 52* and I keep loosing. It makes me really ask myself, what did I do to get to this way and was it ever worth it. The most uncomfortable part of this journey was the post-operation diet, but I have a lot more energy now. I would be taking at least 4-6 Advil every day for pain, ever since the day of my surgery, I have not take any pain pills. 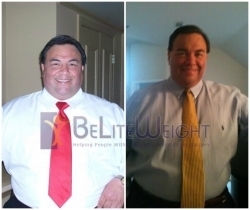 If you're miserable and uncomfortable, this surgery and the people at BeliteWeight takes it away and gives your confidence back, I am paying it forward.